I love cheese. I love the savory, salty flavors and the creamy textures. I love how it pairs with a diverse variety of foods, from fruit to crackers and breads, to vegetable crudités and antipasto. I am far more likely to crave cheese than any other food. But I don’t love how cheese makes me feel—at least the standard variety of dairy cheeses. Not just lactose intolerant—an inability to digest milk sugar, I am fully allergic to dairy products and that includes cheese. As a holistic nutritionist, I know that most dairy products are not healthy options for a wide variety of reasons. 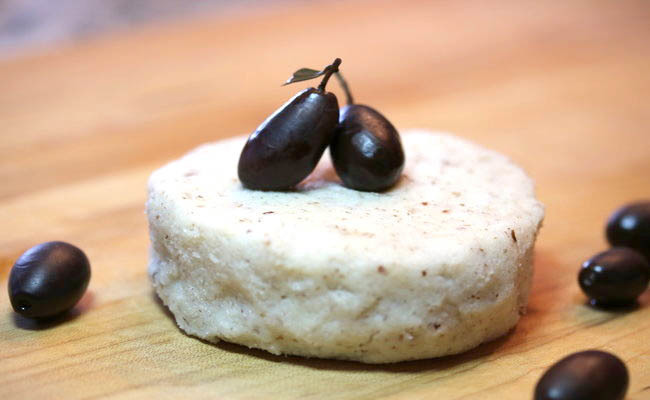 But, once I applied fermentation techniques I learned over the years to nuts and seeds during the creation of my book The Cultured Cook, I realized that I could create delicious, creamy and versatile cheeses and even cheesecakes that were completely free of dairy products. I don’t have to live without cheese, I just need to focus my attention and diet on plant-based options, which offer a wealth of unique and amazing flavors to draw upon. Most vegan cheeses are made without fermentation and those that are fermented are also typically heated after being cultured which completely destroys any beneficial microbes, leaving them free of health-promoting probiotics. 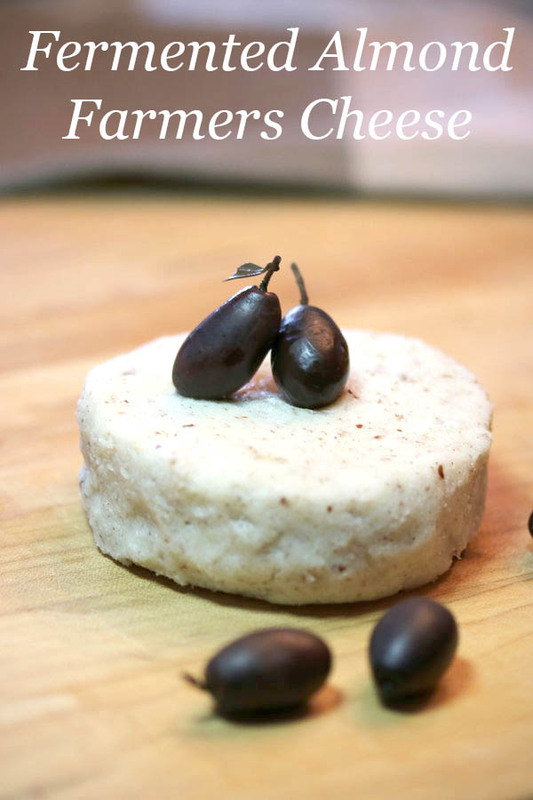 I always make my plant-based cheeses using fermentation techniques that impart both rich flavors and plentiful amounts of probiotics and this Almond Farmer’s Cheese recipe is no different. I call this cheese “farmer’s cheese” because it uses the same type of process as traditional dairy-based farmer’s cheese except that I used almond milk instead of cow’s milk, and I ferment the cheese and traditional dairy farmer’s cheese is not fermented. The milk is heated, an acidifying agent is added (in this case I’ve used vinegar), the curds are separated from the whey and further strained to form a block of cheese. Then, the cheese is fermented to further develop the flavors and boost its health benefits through the proliferation of probiotics. You can add herbs or other flavor additions to suit your palette. Even without adding herbs, this cheese is a simple and delightful option. You can spread it on toast; eat it with fruit, crackers, nuts or vegetable crudites; serve it with olives or antipasto; or enjoy it with a little fruit jam or coulis (a fruit sauce) as a dessert. This cheese and other cheeses made in this manner tend not to have any probiotics unless they are added after the milk has cooled and the cheese has been set. Typically, most cheeses that are aged are inoculated with yeasts or molds at that point—but not always ones that are health-promoting. You can age this cheese if you’d like to, although traditionally farmer’s cheeses or soft cheeses like this one are not aged (not fermented), and do not contain any probiotics. In a medium-sized pot over low heat, heat the almond milk, stirring occasionally to prevent scalding or sticking. Turn off the stove when it looks like the almond milk is just about to boil. It is not necessary to use a candy or canning thermometer but you can if you prefer. In that case, remove the pot from the stove when the almond milk reaches 180 to 190 degrees Fahrenheit. Add the vinegar. Gently stir for a few seconds then leave it undisturbed for a few minutes. It will begin to form curds (the solid parts) and whey (the clear-ish, yellowish fluid). Line a colander with cheesecloth and pour the curds and whey through it over a sink (or over a large heat-proof bowl if you prefer to keep the whey for later use). Place a clean weight over the almond cheese and allow it to sit for one to two hours to encourage the removal of excess whey. Alternatively, tie up the corners of the cheesecloth and allow to sit for one to two hours to continue draining. Stir in the salt and miso until well combined and place the cheese in a mold or small glass or ceramic bowl. Cover with a clean cloth and set aside in a cool place for 12 to 24 hours depending on how sharp you prefer your cheese. Shorter culturing times result in milder tasting cheeses while longer times yield sharper cheeses. This culturing stage encourages the proliferation of beneficial bacteria and yeasts in the cheese. Do not culture for longer than 24 hours or the cheese will become vulnerable to spoilage. Dr. Michelle Schoffro Cook, PhD, DNM is the publisher of the free e-newsletter World’s Healthiest News, the Cultured Cook, co-founder of BestPlaceinCanada, and an international best-selling and 20-time published book author whose works include: The Cultured Cook: Delicious Fermented Foods with Probiotics to Knock Out Inflammation, Boost Gut Health, Lose Weight & Extend Your Life. Follow her work.